This month, Slotland.com – among the very first online casinos -- has been celebrating their tenth birthday. They’ve launched a Spanish version of their all-slots-and-video-poker site (http://es.slotland.com/) as well as a new game at their 3D casino (WinADay.com) and a free slot tournament site (FreeSlot.com). A special birthday contest has awarded a $5000 vacation package to one lucky player. There weren’t many other online casinos around when Slotland launched way back in 1998. Since then, Slotland has developed an impressive suite of online and mobile games and has earned a reputation for being one of the most reliable and trustworthy online casino sites. This month’s birthday celebrations included a week-long Birthday Contest. All players making a deposit of $100 or more between October 1st and 8th were automatically entered in the free contest. In a random draw a Swedish player known as “FACTOR” won a $5000 vacation package to the destination of his choice. With the tenth birthday coming up, Slotland checked their records to see if they had any current players that had been with them since the early days. They found quite a few players that play regularly on the site that have been playing at Slotland for many years. 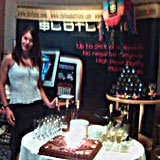 Slotland celebrated their 10th birthday at CAP Euro last month in Barcelona. While in Spain, the company also celebrated the launch of their new Spanish site and introduced affiliates to the new WinADay.com 3D casino. Photos and video clips from these events are available from the Slotland.com news blog: http://www.slotlandnews.blogspot.com/.